Produce RFID smart labels in-line on your press with the Tamarack P500 RFID. 1. Label face stock is printed, then delaminated from the release linerand routed to the Tamarack P500 RFID module. 2. A roll of RFID inlays is unwound, fed to length, and routed to the vacuum applicator and cut-off unit. A registration sensor for the inlay web assures cut-off between antenna repeats. 3. The inlay web is held to the vacuum cylinder until each inlay is cutt off and then joined to the exposed adhesive of the face stock web. 4. The liner receives a pattern coating of hot melt adhesive to eliminate an adhesive void in the area of the inlay. 5. The face stock and liner webs are relaminated and routed to the press finishing section. The Tamarack P500 RFID affixes inlays from 3/8" to 13" wide and from 3/8" to 9" long, meeting the requirements of all inlay products. Set-up is straight forward, with job parameters entered via a touch-screen control. Servo-driven components provide flexibility and productivity. 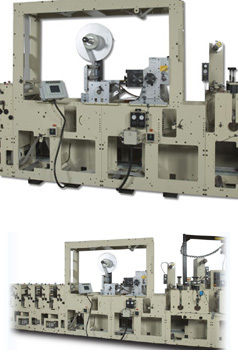 The affixing equipment can be adapted to a different part of the press, or relocated to a different Mark Andy press, as smart label production requirements change. The servo-driven components allow inlay affixing on all label repeat sizes without the need for gear changes or cylinder changes. Modular equipment approach provides growth path. The affixing equipment is designed to provide simple, one-wide operation to start, and components can be added as production demands increase. For example, a second unwind/feed station can be added for two-stream operation, inlay verification systems can be accommodated, and splicing units can be added to avoid stopping for inlay roll changes. As a result, the Tamarack P500 RFID provides smart label capability to meet current production concerns - such as defective tag removal, high inlay cost, and short inlay roll lengths - yet offers productivity when high volume production is required - by affixing all inlay sizes, two-wide, at speeds up to 500 ft/min, for three-shift operation. Electrical requirements 380 to 480 volt, 3 phase, 50/60 Hz. , 30amp.